Summary: Given a clear day this is possibly the most scenic walk in the North Western area of the Lake District. 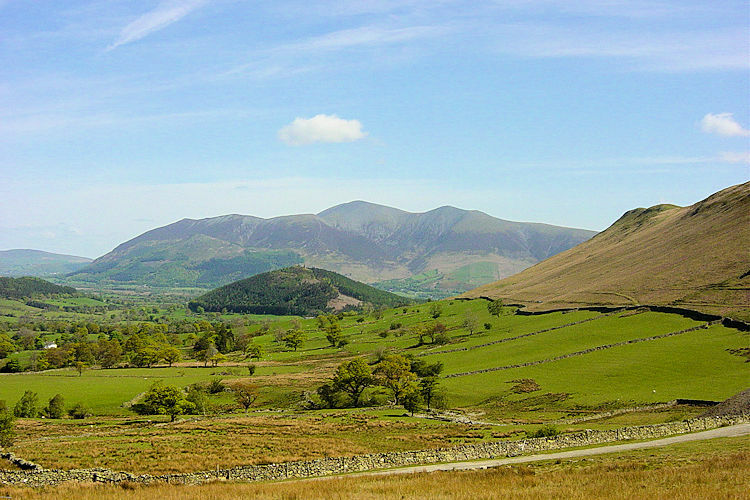 While the walk never reaches the lofty heights of a Scafell or Helvellyn (the highest point is Dale Head at 753m) the views available are magnificent, particularly to the Skiddaw and Blencathra massifs in the north east. 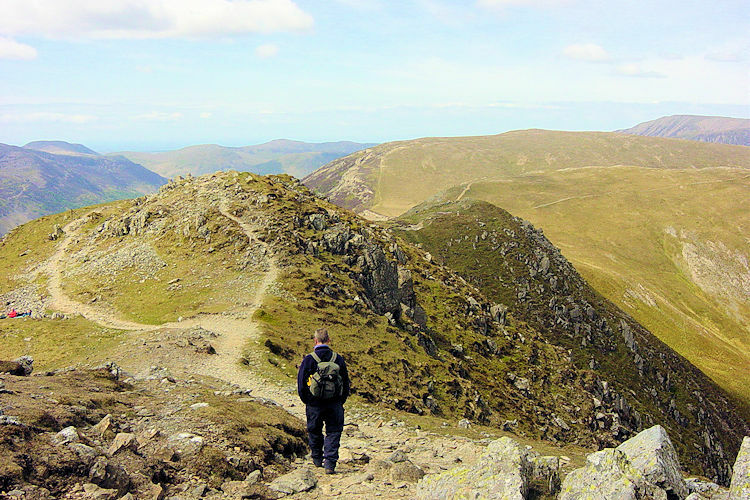 It is a classic horseshoe walk around the beautiful pastoral Newlands valley and although the walk aims for ridges as much as possible it is an undulating circuit with three separate ascents and descents. Although most are easy the first ascent and the last descent which are anything but. The work is worth it though and if you are in this area and the day is set fair then I recommend you take this walk. The awesome views will take your breath you away. 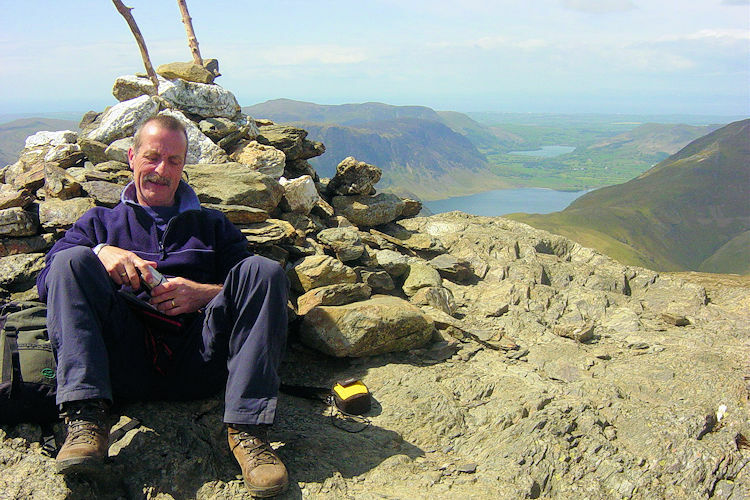 It was the third day of a five day walking break my pal Steve and I were enjoying in the Lake District during Spring of 2005. Remarkably it was the third settled day in a row. Even better it was the sunniest start of the break so far and thus after breakfast in our Ambleside accommodation I directed Steve who was today's driver to make his way north on the A591 towards Keswick. 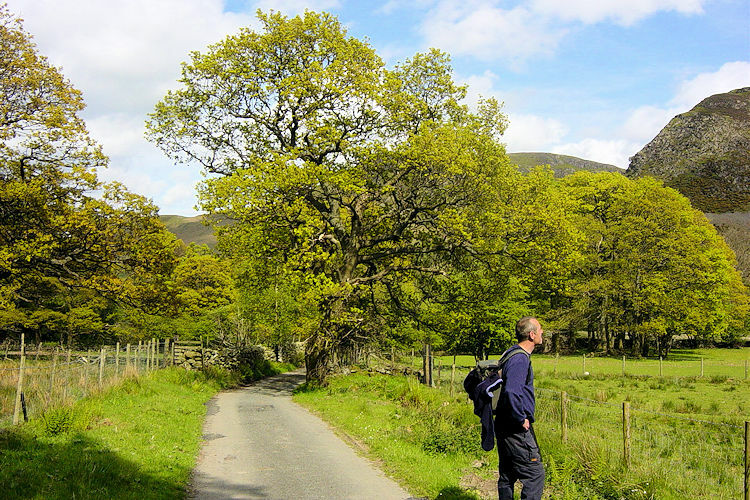 The sun shone brightly on the Lakeland scenery as we drove past Thirlmere, bypassed Keswick and made our access to the Newlands valley at Braithwaite. It was a super feeling looking up to the cloudless sky as Steve negotiated the tight lanes between Braithwaite and our starting point at Little Town. Clouds were not forming today nor likely to when the sun had got to work. 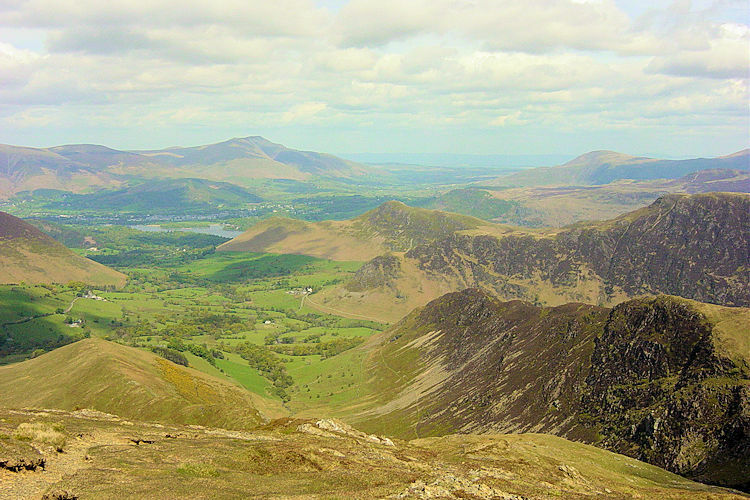 The views over the Lake District from high up over Newlands were going to be fantastic. And having read about this walk before going for it I knew it was all about the views. And so it proved to be. After a little trouble finding the path when leaving the car park near Chapel Bridge we were on our way. 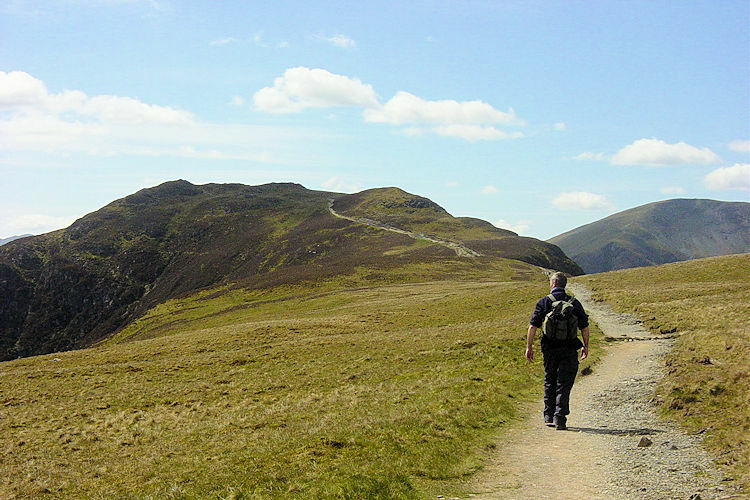 The track took us up a saddle between Cat Bells on our left and Bull Crag on Maiden Moor to our right. It was a tough uphill pull from the start and I felt it more than Steve. He headed for a little man made cave halfway up the track and waited there until I reached him. The sun was already doing its work and we both shed a layer of clothing at the cave which I explored. It was not a very exciting cave. Just a hole hewn out of the hillside. The views outside were much more exciting and so we climbed onto the saddle and then tracked south past Trap Knotts to Bull Crag. If you are on this section on a good day then I bet you cannot stop looking behind you. 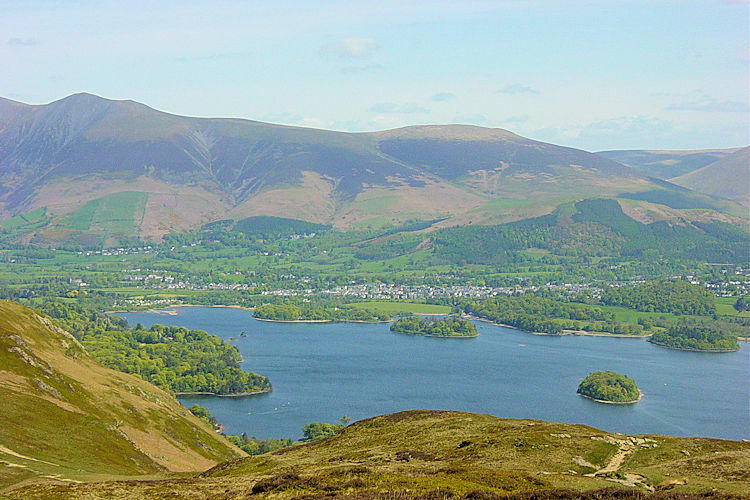 The views to Derwent Water, Keswick, Skiddaw and Blencathra are the best there are some of the best in the Lake District. I will never forget the moment after I stopped and put hands on knees to catch my breath as I turned round. It was utter amazement at the view before my eyes. One of those real WOW moments. 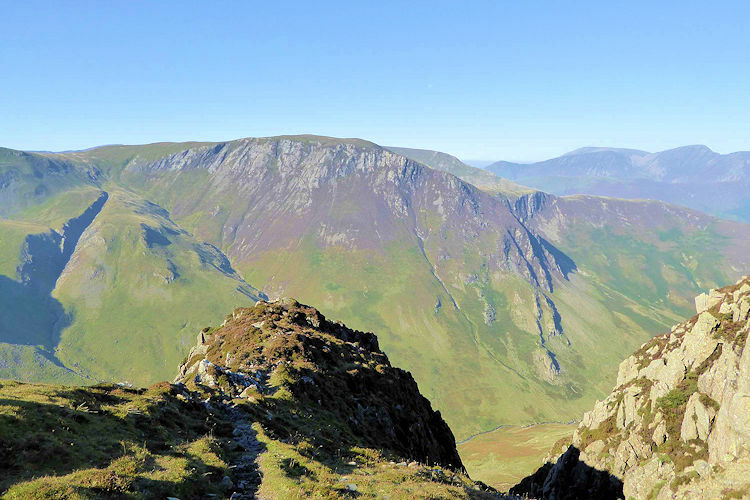 Every time I stopped on the heave up to Bull Crag on the crest of Maiden Moor I looked back again and again and again. I could not get enough of the marvellous spectacle. 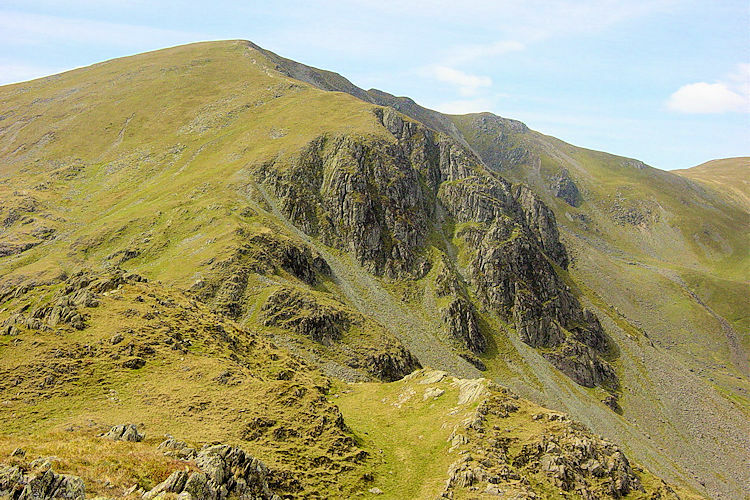 Eventually I had to leave the stupendous view behind as passing Bull Crag took it from me. There was a walk to resume and what a walk. 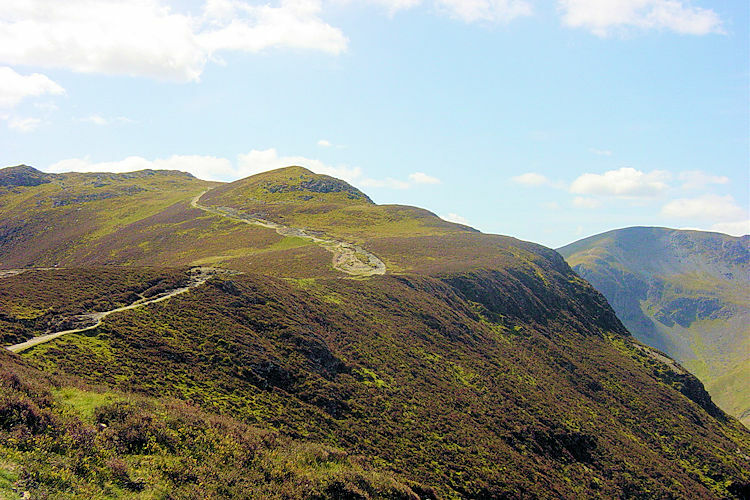 The next two miles were a delightful easy stroll across the ridge between Maiden Moor and High Spy. We were walking on exposed ground at an altitude of around 600m but as it was lovely and warm it could have been a walk at a much lower level such as alongside a river. Despite being mid May we walked in brilliant sunshine with little to no breeze at all. Steve and I could not have hoped for much better. Minimal effort was needed now so we found time to chat, pleasantly so...until, when at High Spy, Steve saw it. "I thought this was a ridge walk?" he exclaimed. "It is" I replied. "That does not look like a ridge to me"
He was pointing to the drop down to Dalehead Tarn and the steep climb from there to Dale Head top. And it was steep. "I admit it is steep but it is only 200 metres of ascent. We have already done twice that" I said reassuringly. He grumbled on...but then we love the banter. Still moaning as we reached the tarn he then shot up the climb. There was no talking on the climb and I followed counting 100 steps then taking a breather as I often do on steep climbs. We were soon up the path to the summit of Dale Head. During the walk we had walked without any other people in view. 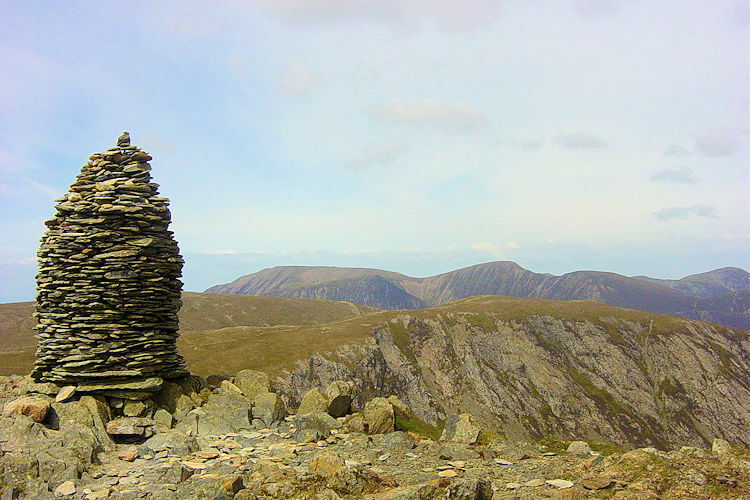 At the cairn on the summit of Dale Head things changed. When we had arrived there were already a couple sat by the cairn having lunch. As we sat to have a drink break of our own another younger couple arrived. Then soon after them a third couple. They asked one of the other couples to take a picture of them. Four pairs on the same hill at the same time and the only pair not an item were Steve and I. 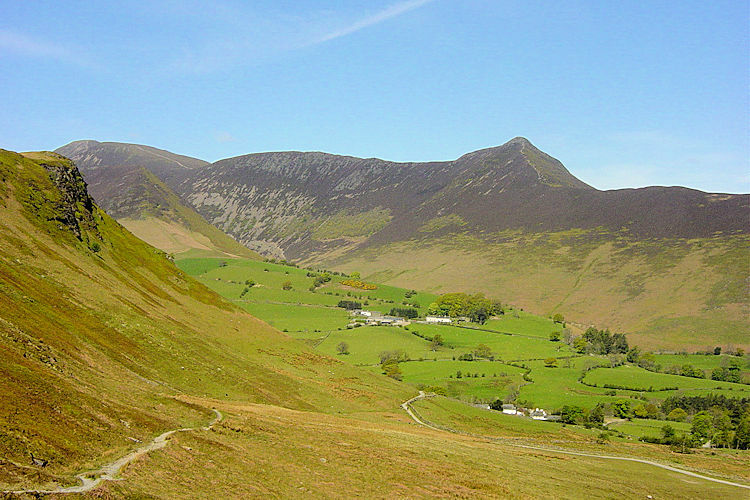 What we all did share was the best of days on the Newlands Horseshoe. When we had arrived at Dale Head another aspect of this tremedous walk presented itself. 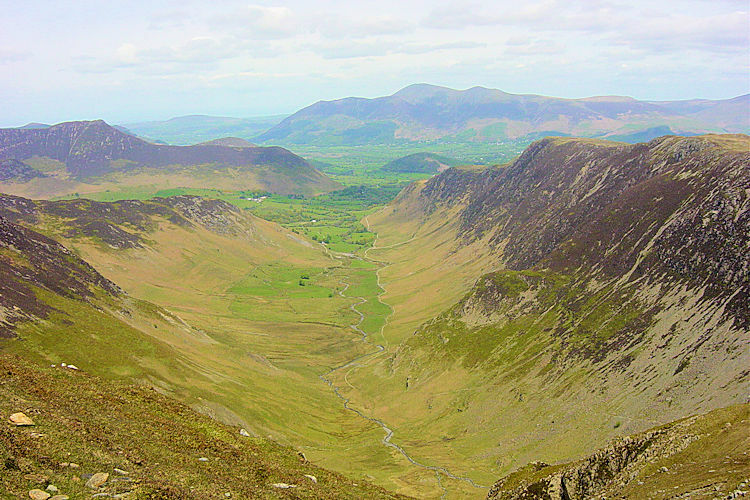 As I mentioned the views to Newlands and beyond had always been with us on the walk. Now there was more. 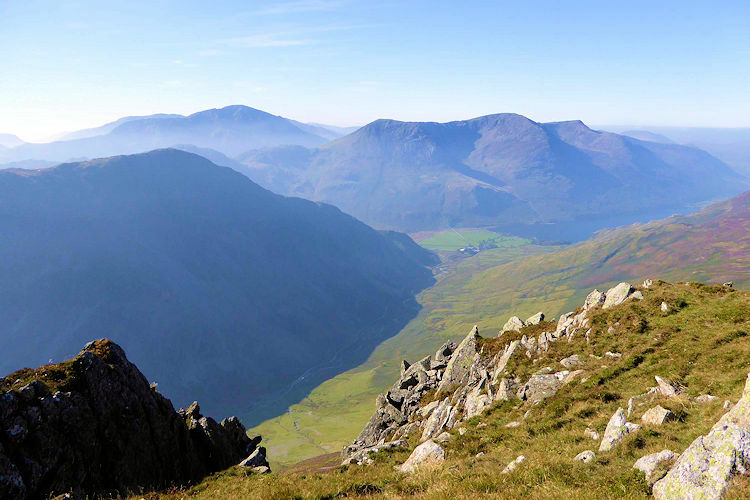 Below us and across to the south was Honister Pass with Haystacks, High Crag, High Stile and Red Pike. we could even see Pillar where we had been two days ago. To the west was Buttermere. The Scafells could be seen too. It was a fantastic mountain spotting moment. After taking our fill of the mountains on offer we moved on to continue our thrilling day. Now we had more ridges to do. After leaving Dale Head there was a thrilling section of walking along Hindscarth Edge and then a walk to Hindscarth summit which neccesitated a walk back along the same path to continue the walk along Littledale Edge which took us on towards Robinson, our final mountain of ther walk. 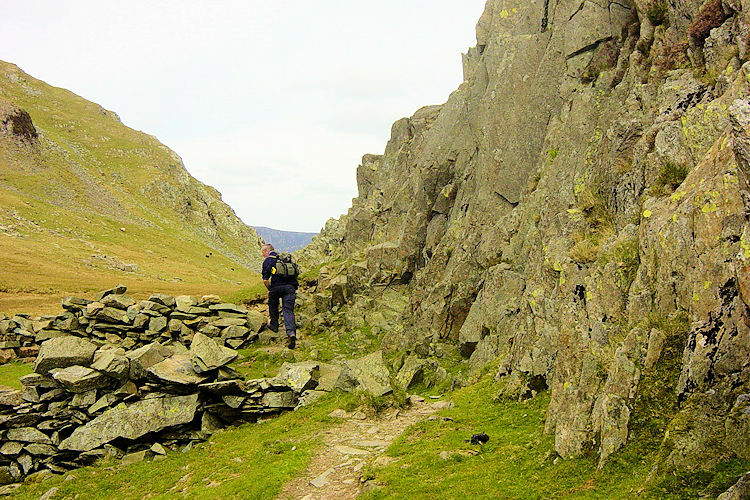 Despite having the term edge in their descriptions neither Hindscarth nor Littledale offered any problems - the ridges are broad and a delight to walk across. The final section of Littledale Edge also provided us with our third and final climb of the day,a tough little clamber of 170 metres over half a mile of walking. It was a short arduous ascent and I was grateful for the lunch break at the summit cairn on Robinson. More sights were provided to us at the summit. 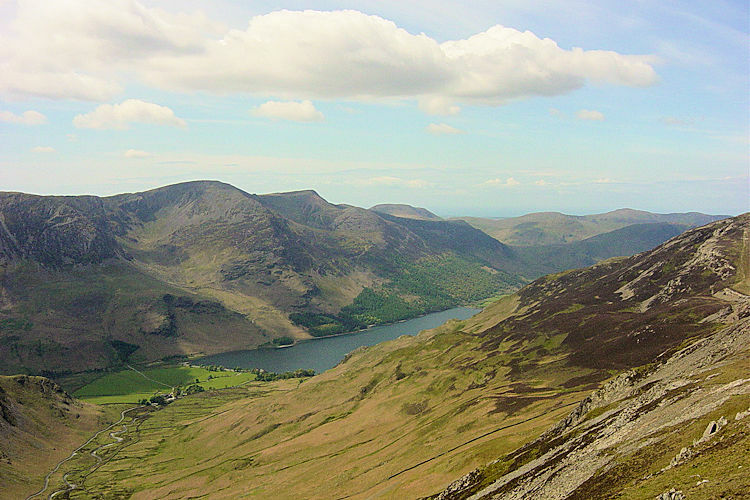 Now we could see down to Buttermere, Crummock Water and Loweswater on the western edge of the park. While we were eating our lunch two chaps passed us from the opposite direction. The senior walker of the two mentioned the tough ascent of Robinson they had made with some unavoidable scrambles. The mention of unavoidable scrambles was not what Steve wanted to hear. And so after lunch we left Robinson and entered the most exciting phase of the walk. As you can see from one of the photographs it was a steep descent and on a couple of occasions we had to shimmy down the mountain on our backsides. 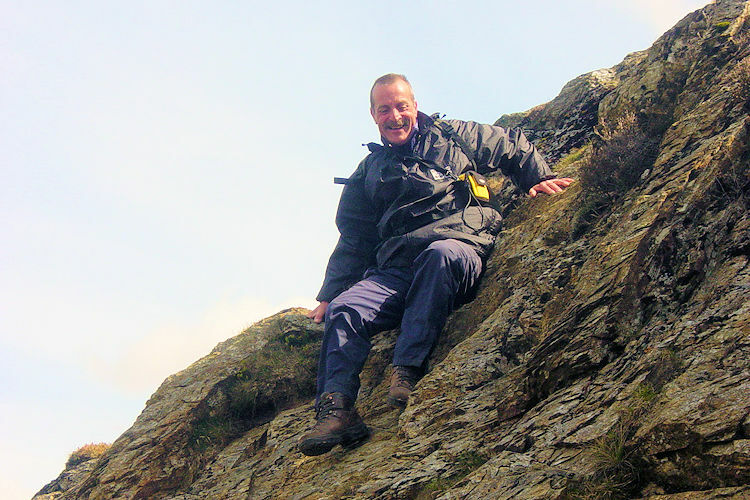 It was exciting for me, not a word Steve would use, and he did mention when looking back that he would have found the scramble on Robinson technically difficult and even very risky in poor visibility. Note - I advise caution on this section in such conditions. After the thrills of the scramble from Robinson the walk quickly lost its mountainous feel as High Snab Bank was reached. The walking was now on grassy slopes and not craggy rocks. Views were still pleasant but with lost height not so extensive. 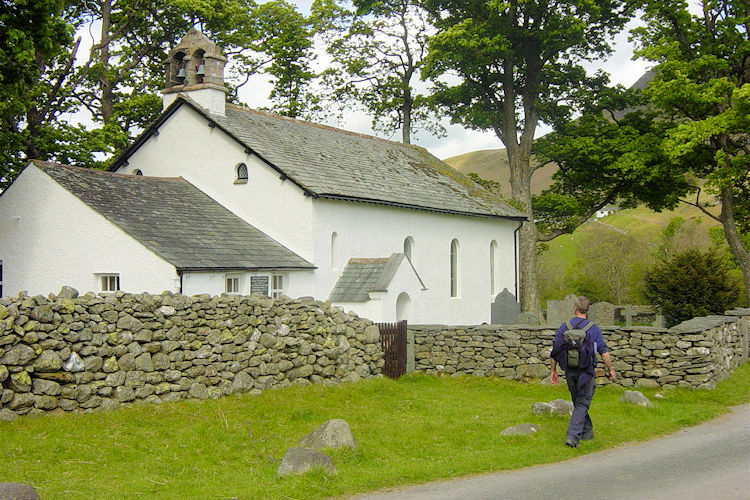 We continued down the bank and then along the road past Gilbrow Wood to reach Little Town Chapel. As we passed the quaint white building we noticed the doors were open and some walkers emerged who had been looking inside. We admired the building which according to a notice was previously a school house. I could not imagine it was ever filled to capacity in this the quietest of valleys. After the chapel we were soon back at the car, our fantastic walk done. If I was to recommend one walk in the Newlandsvalley then it would have to be this one. A truly remarkable walk.